From the runways to the red carpet, big hair is huge again. Fortunately, you don’t have to go to such extremes. Here, Oribe shares his tips on how you can take your hair to new heights. You’re known for big, glamorous styles. What’s the secret to long-lasting volume? Get good texture right from the start. Blow-dry with a round brush, and when a section dries, replace the brush with a Velcro roller while the hair is still hot. This will lock in body and some curl. Back-comb your hair—you don’t have to go to crazy lengths; just enough to keep your hair full at the roots. Pump up the volume: Brigitte Bardot is the mane attraction at a 1968 movie premiere. Spray Oribe Dry Texturizing Spray on the roots—or throughout the hair—to add volume where you need it. Seal the style with a good hair spray, like Oribe Superfine Hair Spray. Redo your hair as often as you need to. If you want really exaggerated volume, consider a fall or a hairpiece, which will give you more hair to work with. What are some glamorous hairstyles for day? Glamorous can mean many things. It could be a tight bun in the back of your head, a super-glamorous movie-star look, a style that’s slicked back with Oribe Gel Sérum and parted in an androgynous way, a back-combed look like a Tippi Hedren French twist … It’s all about knowing what works for you and your lifestyle. You can wear an easy updo, but make sure it looks intentional. Problems start when a look is neither here nor there; make sure it’s stylized. Which hairstyles have stood the test of time? Textured, biggish hair has always been great. I first created that look on Claudia Schiffer and Cindy Crawford in the ’80s and ’90s, and I just did the same type of style on Sofia Vergara for an ad campaign. That style always comes back because, at the end of the day, it’s very sensual and beautiful. Oribe Gel Sérum and Dry Texturizing Spray. 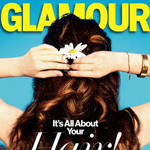 What are the top secrets for getting and maintaining glossy hair? Use shampoos and conditioners [suited for your hair type] and a regular mask treatment. I recommend Oribe Signature Moisture Masque, which you can use in place of a conditioner once a week—or you could leave it on while you watch TV and then rinse it out. The key to glossy hair is keeping it healthy and hydrated. Don’t abuse your hair by overusing heat-styling tools like flatirons. Think of your hair like fabric: If you keep overheating it, it’ll wear out. Have your celebrity clients taught you anything about hair? Jennifer Lopez taught me a lot. She showed me how to work with the little “baby hairs” you sometimes find near your hairline, how to work with tiny broken pieces and make them not only work but look great. I learn something from her every time we work together.